Patches of Red Tide were spotted just beyond the surf line yesterday at Estrella del Mar. 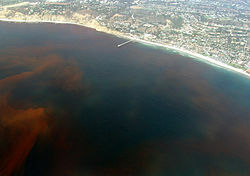 Red Tide is caused by an algal bloom of a variety of minute phytoplankton. Some red tides can be harmful to marine species due to toxins or oxygen depletion. Human effects are limited to skin irritation, burning or rashes. Scientists are unable to pinpoint the causes of red tides but they say that they can be caused by human activity, such as water pollution due to agricultural runoff rich in nutrients or water pollution due to sewerage runoff. Considering that the local Mazatlan newspaper recently reported that the Villa Union water treatment plant has been leaking and is under extensive repair does not make me want to go swimming right now. More information on Red Tide is available at Wikipedia.